Let’s face it: ageing is what lies ahead. But for most us, whether at 40, 50 or even 60 would have given little thought to the challenges of healthy ageing. According to the Health Promotion Board (HPB), one in four Singaporeans aged 40 years and above has at least one chronic disease – high blood pressure, high cholesterol and stroke. On top of that, the risk of getting one or more of these chronic diseases increases with age. So no matter how distant you may feel you are from your silver years, it’s never too early to start cultivating some good healthy ageing habits. Apart from staying physically and mentally active, maintaining a healthy diet is a very large part of why you are more likely to enjoy the process of ageing. Yes, it’s a no brainer that going ‘Mediterranean’ – a diet comprising fresh fruits, vegetables and whole grains, is one of the healthiest ways to eat. However, there are other crucial elements to include in your diet that have a more direct impact on certain aspects of your health. 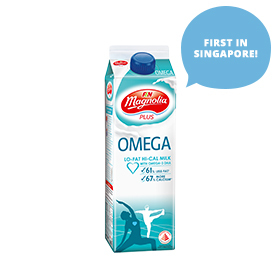 With the knowledge that nearly one out of three deaths in Singapore are due to heart disease or stroke and one in every five people with osteoporotic hip fractures died within a year; omega-3 milk is one of the few options that offers all the necessary nutrients for easy ageing, together with a well-desired convenience. A study that followed nearly 300 men over five years led by Dr Akira Sekikawa from the University of Pittsburgh reported that middle-aged Japanese men who included omega-3 in their diet had a lower incidence of coronary artery blockages, caused by diseases like high cholesterol, hypertension, high blood pressure, obesity and diabetes. The magic of this essential fat doesn’t just end at prevention. In fact, it appears to improve cardiac structure and heart functioning above and beyond, as noted by Director of Cardiac Magnetic Resonance Imaging at Brigham and Women’s Hospital in Boston, Dr Raymond Kwong. With calcium added to the equation, your heart is even better taken care of. Calcium is essential for the day-to-day functions of the heart. It is involved in the electrical performances, contraction and relaxation of the muscle. Normal calcium levels both inside and outside of your heart cells are likely to ensure a regular heartbeat and sound pumping action of your heart too. Calcium plays a similar role such that it helps with storing and retrieving memory. By delivering signals from the outside to inside of brain cells by combining key proteins, it facilitates efficient communication in the nerves of your brain, which helps to forestall memory loss. As you live longer, the scaffolding that holds your body up needs support too – to last a long lifetime. Calcium is natural bone cement that is continuously removed in small amounts and in need of replacement. This explains why most older folk have brittle bones and take longer to heal after a fall. Since bones have their own calcium “bank account”, depositing as much calcium will prove beneficial in the long run. Vitamin D is another nutrient found in omega-3 milk that supports the absorption of calcium into the digestive tract, when it enters the body together with calcium. With osteoporosis as the lead cause of 1.5 million fractures including 300,000 broken hips in women (as published by Harvard T.H Chan School of Public Health), milk should not be excluded from the diet. Omega-3 with DHA in particular has also been found to be a vital constituent of bone marrow and a contributor to enhanced bone mineral content. For all these reasons, omega-3 milk should make it to your list of mainstay items in your refrigerator. So even though omega-3 supplements are almost as good as the real deal, they aren’t all-rounded enough to give you the overall nutritional boost you need. Omega-3 milk on the other hand, is full of natural hearty goodness. It is also 25% lower in saturated fat and higher in calcium compared to regular milk! A velvety chocolate version of the omega-3 milk is also available if you’re one who prefers reducedmilkiness. What’s even better is that chocolate omega-3 milk contains 25% less sugar! When stocking up on any type of fresh milk, be sure that it is fresh and safe for consumption at all times. While fresh milk is pasteurized to make it safe to drink, the nutrient-laden creamy beverage still remains a delicate fresh produce. Once a carton of fresh milk is opened, it is exposed to oxidation, loses quality and begins to lose its freshness rapidly. The Agri-Food and Veterinary Authority of Singapore (AVA) recommends that milk when opened be consumed within two to three days. Milk opened any longer than this runs the risk of becoming infested with unhealthy bacteria. It is therefore advisable to consume milk within three days, as it is during this period that milk stays its freshest after its seal has been broken. You should too, change up your purchase pattern to buy two 1-litre cartons of fresh milk, instead of two 2-litre bottles.